GET REWARDED SIMPLY BY SHARING! Join the new Treasure Pod referral program that rewards you for helping us create more dream homes at lower costs (we pass on the big marketing savings to you AND your referrals)! * For general affiliates. For partner affiliates (businesses, property agents), after sign up, see the “Direct Referral” section in your dashboard for details. Simply login and copy your unique referral link(s) from your Affiliate Dashboard, and share them in your blog posts, emails, websites, Whatsapp (and others), and social media. 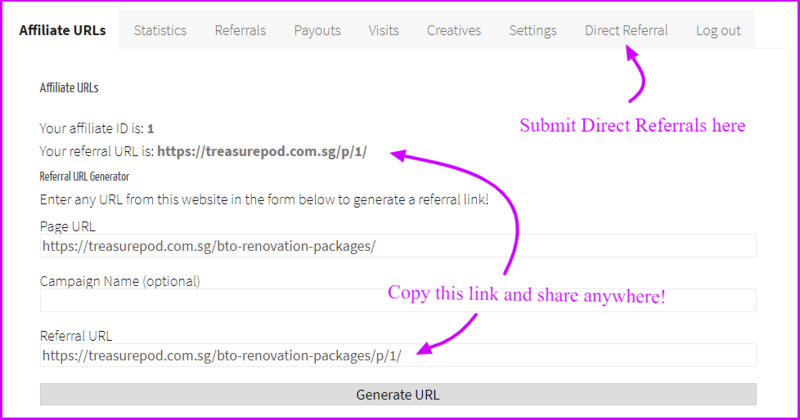 You can link to any page on the Treasure Pod website – eg. BTO / Resale Quote Request pages, Renovation Budget Calculator, Contact Us page, Homepage, or even a blog article. Our system will track the visitor and attribute it to you no matter which page he/she navigates to. Every visitor you send is automatically tracked (for 90 days! ), and referrals (ie. submission of ANY form) are instantly reflected in your Affiliate Dashboard. Your earnings are paid to you every 2 weeks via Paynow. The minimum amount for each payout is $30. Account balances below the payment threshold will be brought over to the next period. 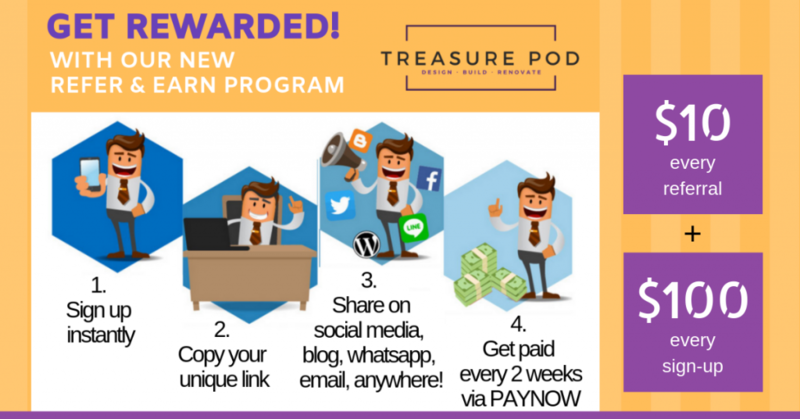 What is Treasure Pod’s Refer and Earn Program? It is our new affiliate program that rewards you for simply sending potential renovation customers to our website. You earn affiliate fees when your referral meets us for a free consultation, and also when they sign up for Treasure Pod’s renovation service. Direct Referral is our business partnership program with companies and professionals in vertical industries such as real estate, property management, and home improvement. Please visit the “Direct Referral” section in your Affiliate Dashboard for details. We manage our affiliate program in house. To join you simply need to apply to the program by registering here. You can do this by sending us visits via your unique affiliate links. You can use any form of linking like text links, social media links, reviews, images and banners (get them from the Creatives section in your Affiliate Dashboard). Each time a visit leads to a meeting / service sign-up, you earn an affiliate fee. Business and industry partners can also submit direct referrals from within the dashboard. No. It’s totally free to join our affiliate program. Can I promote Treasure Pod on more than one channel? Yes, absolutely. The more links and content you place and share, the more qualified visitors you’re likely to send us — and this should translate into higher earnings! Be our 1st 50 affiliates and receive an instant bonus of $18 when you sign up today!